Everybody knows the story of the Titanic, the supposedly unsinkable ship that struck an iceberg in April 1912 and sank, carrying over 1,500 people to their deaths. Most people know the Oscar-winning film starring Leonardo DiCaprio and Kate Winslet, but the musical, despite winning a Tony for Best Musical in 1997, is more obscure. Titanic: the Musical, has had its maiden voyage at the Muny this season, directed by Don Stephenson. I had never seen the show before, nor had I heard most of the music. I vaguely remember the performance from the 1997 Tony Awards broadcast, and I think I liked it at the time, but mostly I was going into this production blind, and, for the most part, I thought the production was a remarkable success. In the stirring introduction, several musical themes are introduced that carry throughout the rest of the show, including “There She Is”, which refers to Titanic as the “Ship of Dreams”. The entire first act of the show seems to be about dreams. Various characters are introduced and they all have dreams. Thomas Andrews (Tom Hewitt), the ship’s designer, dreams of seeing his vision become a reality. J. Bruce Ismay (William Youmans) of the White Star Line dreams of setting speed records. Stoker Frederick Barrett (Ben Crawford) dreams of completing the journey and returning to his girl back home, while three Irish girls named Kate (Jessica Grove’, Madeline Trumble, and Amanda Choate) and other third class passengers dream of a better life in America. Second class passenger Alice Beane (Michele Ragusa) dreams of rubbing elbows with the elites in First Class, to the bewilderment of her husband, hardware-store owner Edgar (Rich Pisarkiewicz). Also, the crew members of the Titanic led by Captain E. J. Smith (Joneal Joplin) dream of a triumphant maiden voyage for the colossal new ship. The theme of dreams continues throughout the first act, and provides some wonderful moments, like Barrett proposing to his girl via telegraph while radio operator Harold Bride (Telly Leung) sings about the excitement of his job (“The Proposal”/”The Night Was Alive”). Also, the three Kates and the steerage passengers sing of the new jobs they would like to pursue in America (“Lady’s Maid”), and Mrs. Beane sneaks into first class to dance with the elites (“Doing the Latest Rag”, which also features some excellent ragtime dancing). The dreams are shattered as, inevitably, the ship strikes the infamous iceberg and starts to sink. The sinking is handled in a very clever way technically, except for one slight misstep–when a small motorized model of the Titanic chugged across the stage to meet its doom, it drew audible laughs from the audience, which I doubt was the intended effect. Despite that, the air of desperation builds in the second act, and this is helped greatly by the staging, as ramps and tilted sets are used to great effect to suggest a sinking vessel. The second act also brings some excellent musical moments, as Andrews, Ismay, and Captain Smith argue about whose fault the accident was (“The Blame”), and as passengers hurry to their lifeboats, sharing a tearful goodbye with loved ones they must leave behind (“We’ll Meet Tomorrow”). I thought the music by Maury Yeston was excellent, with several repeated themes that ran throughout the show to good effect. Also, the story (book by Peter Stone) was well-plotted and built well. There are perhaps one or two too many subplots, and there are a few characters who are not given much to do, but still the plots come together reasonably well, giving a good cross-section of life in the first part of the 20th Century, and building to a tense and heart-wrenching climax that even made me almost want to cry. As for the performances, the large ensemble worked together convincingly, with solid performances all around. Crawford as Barrett, with his strong stage presence and gorgeous voice, and Ragusa as Mrs. Beane, who handled both the comedic and dramatic aspects of her character in a very believable way, were two of the standout performers. Also notable were Joplin in a solid, commanding performance as Captain Smith, Youmans as the weaselly Ismay, Henry Stram as First Class Steward Henry Etches, and Leung as the determined, eager Bride. The only casting that didn’t really work for me, though, was Matthew Braver as First Officer William Murdoch. Braver tried his best and had a strong tenor voice, but he appeared at least ten years too young for the role, which made the character less believable than he should have been. The sets were relatively minimal as far as the Muny goes. There were a few movable set pieces, like the two-level bridge setup and the radio operator’s office, but most of the set was done with large painted backdrops. The deck of the ship, for instance, was just the open stage with a backdrop of the ocean behind a rail. It was simple but effective, as was the staging of the scenes, using the large Muny stage to full effect as well as suggesting the vastness of the ship. Overall, I thought it was an effective, engaging presentation of a fascinating show. 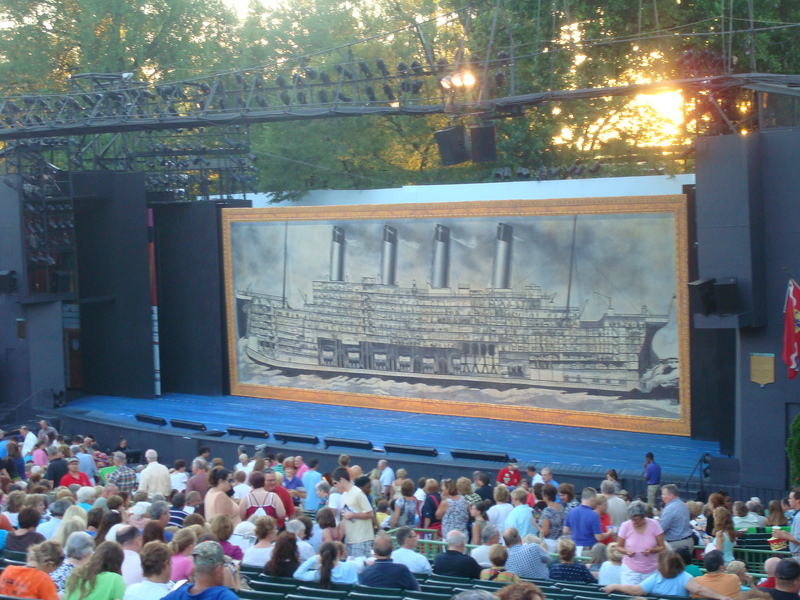 The Titanic was a grand ship and its story is a well-known tragedy of history, and I thought that was presented very well in the Muny’s production. The grandness of the ship was matched by the grandness of the production, and it was an enjoyable, moving experience.